Nails are a touchy subject with me (I’m not able to paint my nails) I get it…the food service industry requires clean, un-polished nails, and I’m okay with that! But thinking back to my school days I would be painting and re-painting about three times a week. I had an un-dying love of polish and a passion for painting. So now when I have a few days off I jump right on the nail care and riffle through my collection to pick my favourites, even if only for a few days. On one of these recent occasions I had trouble picking and I realized I had quite a few favourites for Winter nail colours! Now keep in mind I haven’t kept up with any of the new polishes out there. 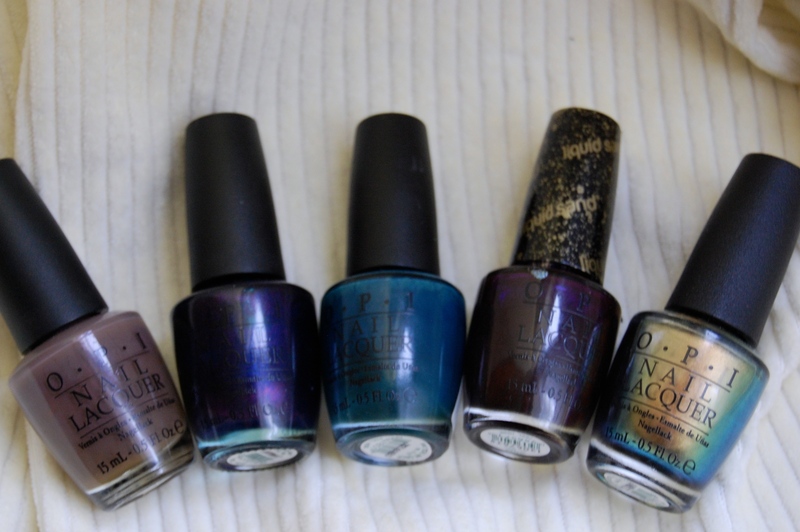 I’ve been relatively polish-free for about two years and all of my favourites are at least that old. I have recently moved on to love Orly polishes, as well as Essie and Sally Hansen, yet my favourites all happen to be O.P.I. I love the range of colours and textures, keeping it on the warmer and darker side for the shorter days and colder weather. 3. O.P.I. Ski Teal We Drop (Russian Collection) A perfectly muted teal for those blue snowy days! 4. O.P.I. Vesper (James Bond Collection) The perfect maroon/burgundy for the warm cozy nights, textured with sand. What are your favourite colours for the winter weather?